Ph.D. in Architecture is a 2 to 3-year Doctoral program in Architecture. Qualifying Bachelors and Master’s degree in Architecture or any equivalent examination with minimum aggregate marks of 50% and above deems the eligibility criteria for the program. The program is covered in the form of semesters along with submitting the research thesis on the completion of the program. The average program fee ranges from INR 55,000 to 1.07 Lacs. Some reputed colleges may also conduct their own entrance examination for processing the admission to the program. This is followed by Direct Interview with the college faculty. Ph.D. in Architecture course enables students to understand the intricacies related to the various aspects of architecture along with rendering them the skills needed to undertake research program. Candidates are required to possess the zeal to gain a deeper understanding of the subject. Those owning the skills of patience to carry out research work in different kinds of environment, those who have the knowledge of designing and applying analytical skills to the subject are considered to be suitable for the program. This program skills students to generate independent designs and construct eco-friendly buildings. Doctorates after the completion of the program are qualified to undertake research program and work for builders and organizations dealing in the construction business. They also have lucrative opportunities in the segments of designing, project management and so on. The average remuneration earned by the students ranges between INR 3 to 17 Lacs annually. Eligibility Qualify B.Arch. and M.Arch. with a minimum aggregate of 50% marks and above. Entrance Examination like NATA, WB-JEE, Work Experience of 4 years. Top Recruiting Companies Construction, Designing, etc. Job Positions Production Designer, Planning and Development Surveyor, Landscape Architect, Architectural Researcher, Building Surveyor, Architect, etc. Ph.D. in Architecture: What is it About? Architecture is the science of constructing and designing buildings, sets which meet the norms and regulations of the state as well as make the lives of people residing comfortably. The science of creating houses which provides comfort and space to the people covers the major aspect of the program. An Architect is well acquainted with the rules set by the government of each state and is skilled to understand the quality of land, whether it is suitable for construction or not. Ph.D. in Architecture enables the candidates to gain a deeper insight into the subject, imparting them the knowledge to conduct research program. The program focusses on the historical and theoretical aspects of the field. Candidates are skilled to deliver original ideas along with contributing their knowledge into the field helping them to conduct research. The students gain the knowledge into the social and political field of the study. 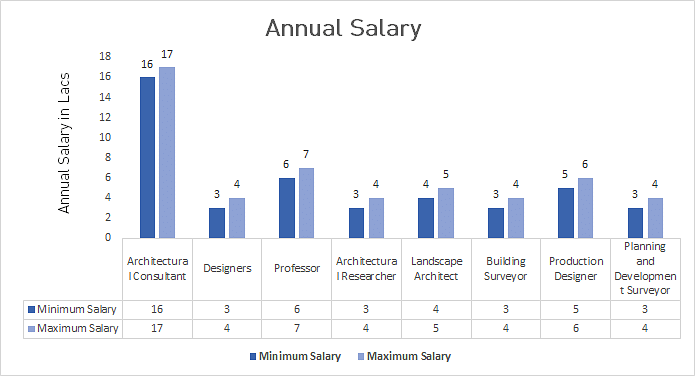 Ph.D. in Architecture curriculum is concentrated on classroom study for the first two years. The students are required to select a specialization topic in the final year, on which the research work would be conducted. The topic for research will be selected by the faculty and the students will have to prepare the thesis under the guidance of experts. During the program, candidates will be taken on field study, helping them know about the different aspects related to construction through practical study. The program will also comprise of seminars and project work. Students will also be required to submit research work in the final year. Ph.D. in Architecture helps candidates explore opportunities in the field of construction, design, and Research. They have job scopes as professors in Universities and Colleges, Production Designers, Researchers, Landscape Architects and much more. The overall aim of the program is to skill the students in imbibing the competence to conduct research and perform well in organizations. Candidates who have qualified the Bachelor’s degree in Architecture or equivalent examination along with Master’s degree in Architecture with minimum aggregate marks of 55% and above from a recognized university listed under UGC/AIU can avail for admission. Applicants will be required to clear the entrance examination held for the PhD program by various reputed universities and colleges. There will also be Direct Interview conducted by reputed colleges. Candidates having a relevant work experience of 4 years as teachers/professor/administration/research are deemed eligible for the course. Aspirants who seek admission to the program of Ph.D. in Architecture are supposed to meet the grounds of minimum criteria as set by various colleges and institutions. Candidates are required to have qualified their Bachelor’s and Master’s degree in Architecture with minimum aggregate marks as prescribed by the respective colleges. Having a minimum of 4 years work experience can add to the benefit of seeking admission. Some reputed colleges may hold their own entrance examination held at entry level to the program of Architecture, which would be followed by Direct Interview to get an insight into the personality trait of the aspirant. The final average percentage will be calculated by computing the marks scored in the entrance examination, Direct Interview, and the qualifying examination. Admissions are processed on the basis of merit list. The cut off for merit will differ for all colleges. Candidates can avail for the application forms from the official website of the college or institution. All the important details pertaining to the admission dates, shortlisted candidates, and prospectus of the program will be notified on the official website. The course study is designed in a manner wherein in the students are rendered deeper insights into the various aspects of Architecture, making students capable to carry on the research work using the skills. The students are taught the various methods of construction. They are skilled in understanding the methodologies to design newer designs and understand the flaw in previous designs. Ph.D. in Architecture qualifies the students to create independent designs which can help the investors in undertaking lesser investments to build houses which meet all the safety standards. In addition, they are skilled to conduct research on to understand the climate and environmental changes that can affect the construction of buildings. Doctorates after the successful completion of the course are skilled to work as designers, researchers with top architecture companies. They can become architects, researchers, architectural consultant along with pursuing teaching in reputed universities and colleges.